I actually considered doing these monthly favourites after I have completed the 31DC2018 prompts but it just doesn't seem right to post a September favourites in October. Since I have started doing monthly favourites posts I have always posted on the last day of the month, and this month really shouldn't be any different. Like usual, I will only be including the things that I have shared on my blog throughout September. This month definitely has seen a lot of nail art. There has definitely been a lot of fails, some inbetweens and ones that I love. I originally had twelve manis for my favourites but I narrowed it down to three. I'm pretty impressed that I count it back so much. I have had a few new stamping plates to play with this month and while a lot of them I really like I don't think any quite fit into my list of favourites. When December rolls around and I sit down to work out my favourites from the whole year I will be thanking me for not adding more plates into the mix. There are a few polishes in this collection that I like, however only two of them are my favourites - Don't Toot My Flute and Grandma Kissed A Gaucho. There has definitely been a fair few indie polishes coming out this month. Of course, a lot of the Grace-full Nail Polish and Emily de Molly polishes have made it into my favourites this month. I'm seriously already dreading trying to narrow down all of my favourites at the end of the year. Maybe I should start trying to narrow it down now so there is some hope of me actually getting the favourites post down before 2019. HUGE fan of this month's release from Emily de Molly. One coater cremes and some gorgeous toppers, what's not to love? You all know that I am such a sucker for purple polishes and flakes! Add them together and you know they are going to be popping up in my favourites. I love the new Enchanted Fables Collection (and so does my daughter - I've had to put them away so that she doesn't steal them lol). Three of my absolute favourites from this collection are Hair-o-ine, Siren Tale and Pick Your Poison. This polish is stunning! Love, love, love it! It's a gorgeous pink and the formula is amazing so there is no way that this baby wasn't going to make it into my favourites this month. Given how much stuff I have done this month I am actually a little surprised that this favourite's post isn't bigger. 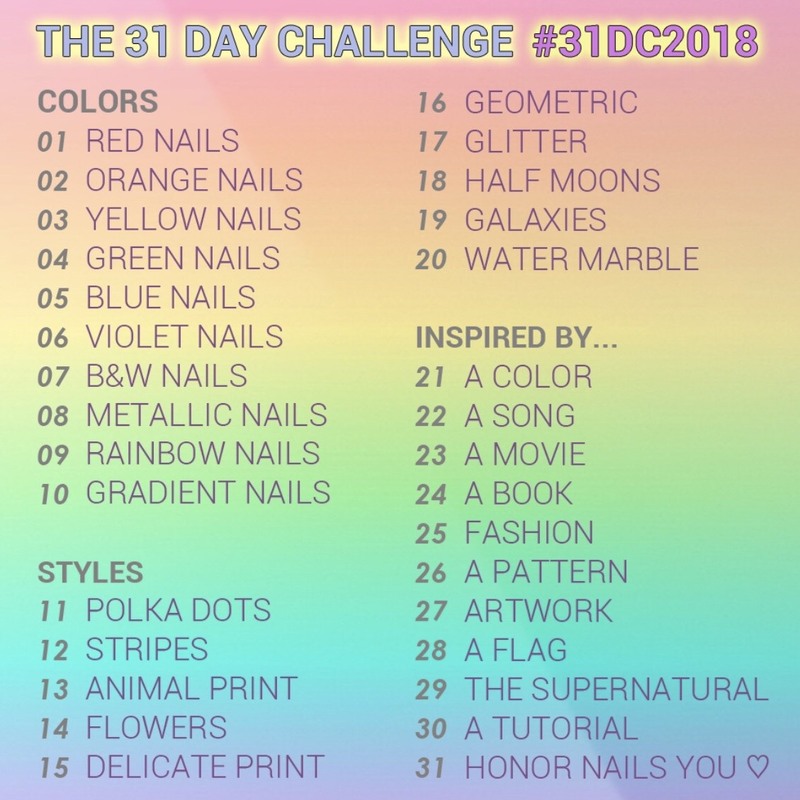 Right, I need to get going so I can do my final mani for 31DC2018! I'm so excited to complete this challenge. Hopefully my mani will turn out good! Guess we will find out tomorrow. Today is the second last day of 31DC2018! Woohoo! I quite like the last two themes of this challenge. It is always fun (and terrifying) trying to recreate someone else's look. For today's look I decided to try and recreate an abstract foil design from Paulina's Passion. I have been looking at my collection of foils for quite some time thinking I really should use them and then Paulina's tutorial popped up along with today's prompt and ta-da! Personally, I don't love my creation (I think it's my colours) but I still love Pauline's version. It's so good! For my mani I used Emily de Molly What A Day, Desert Blooms, Bright Retreat and Colour Alike B A Sunshine. I used the White Gold foil from Dollar Nail Art Store. I seriously can't tell you how excited I am that the 31 day challenge is nearly complete for another year. Only two more manis (after today's) to go! Today's prompt is Inspired By The Supernatural. Originally I had planned to do a Harry Potter type of mani but then I wasn't feeling like doing it. I decided to stick with the witch theme, however it's not at all what I was hoping it would be. Sadly, I started this mani too late in the night that I just have to go with it. For my gradient I used OPI Do You Have This Color In Stockholm?, Funky Dunkey and A Grape Fit! and stamped using Powder Perfect's Black Stamping Polish. 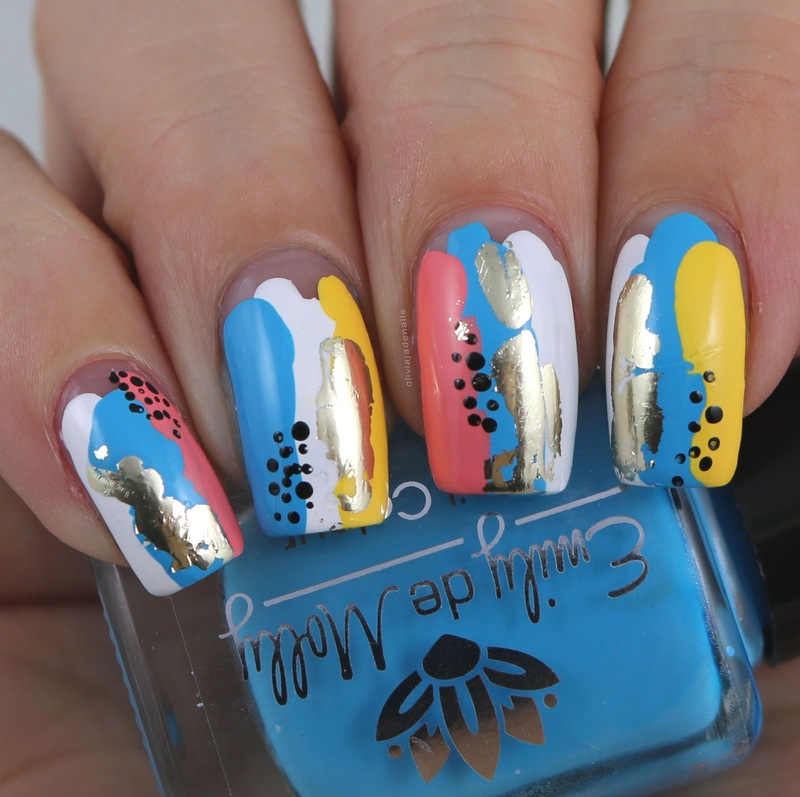 Image is from Lina Nail Art Supplies Spookilicious 1. Now you may be wondering why I said that this mani didn't turn out how I wanted and there is a couple of reasons for that. The gradient is really patchy (especially with Do You Have This Color In Stockholm? - I would just use the other two purples next time) and the image is a lot larger than I was hoping. 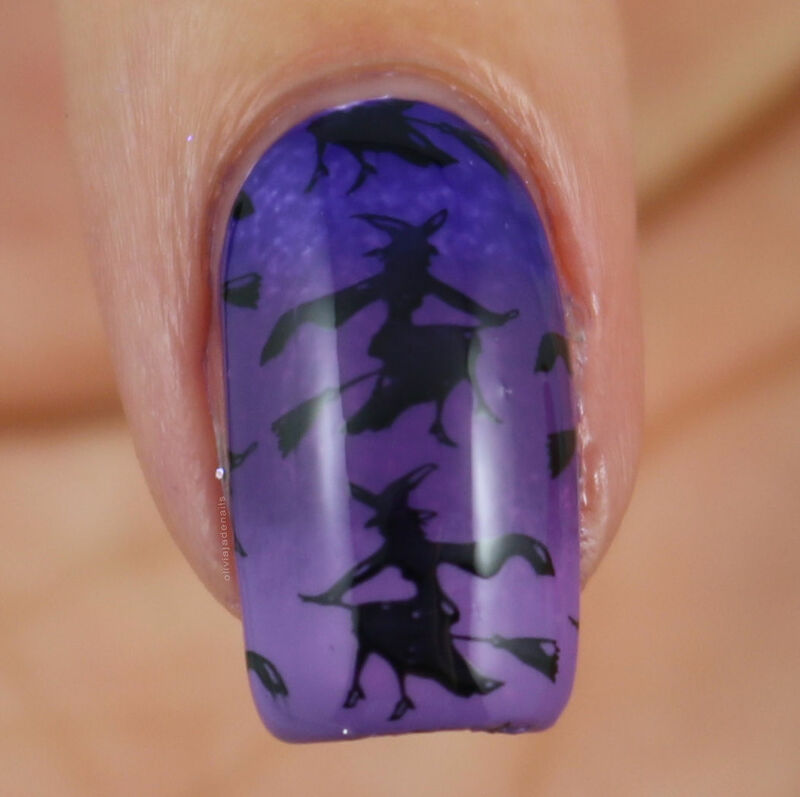 I was really hoping that there would be at least a couple of rows (vertically) of the witches but it just cuts them all too much. Anyway, it is what it is.... now bring on the last two manis! Today's 31DC2018 prompt is Inspired By A Flag. This year I have kinda gone for something completely different. In the previous years I have done simple flags and have had the full mani with the same design. Today, however I have grabbed out these MILV decals (N361) which not only have the Union Jack but some other London themed images. I think these are such cool images, however they were extremely difficult to put on. Do water decals have an expiry date or something? These struggled to stick to my nails and as you can see they creased horribly! They also started to crack so I didn't top coat these. How are you feeling about the 31DC2018 challenge? Excited that it's coming to an end? Sad perhaps? Let me know in the comments. The end of September is fast approaching which can only mean one thing....Halloween is coming! I don't really care too much about Halloween (although my daughter LOVES it - she plans her costume about a year in advance...and changes her mind constantly) but I do love the polishes that are brought out around this time of year. 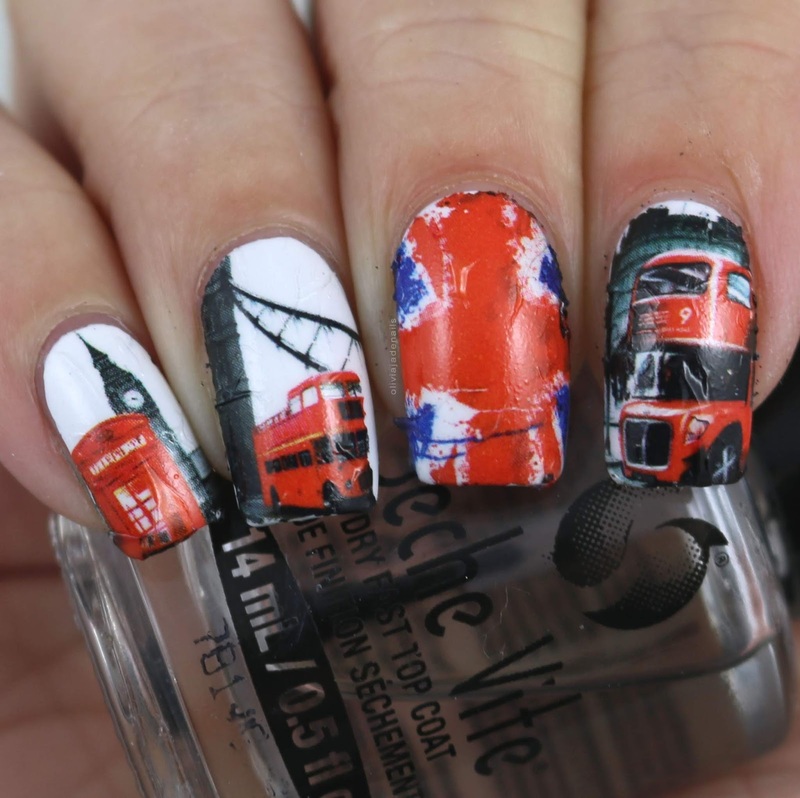 I think there is always some really cool and interesting polishes. This year, Grace-full Nail Polish have got a Halloween Duo which I have to share with you today. 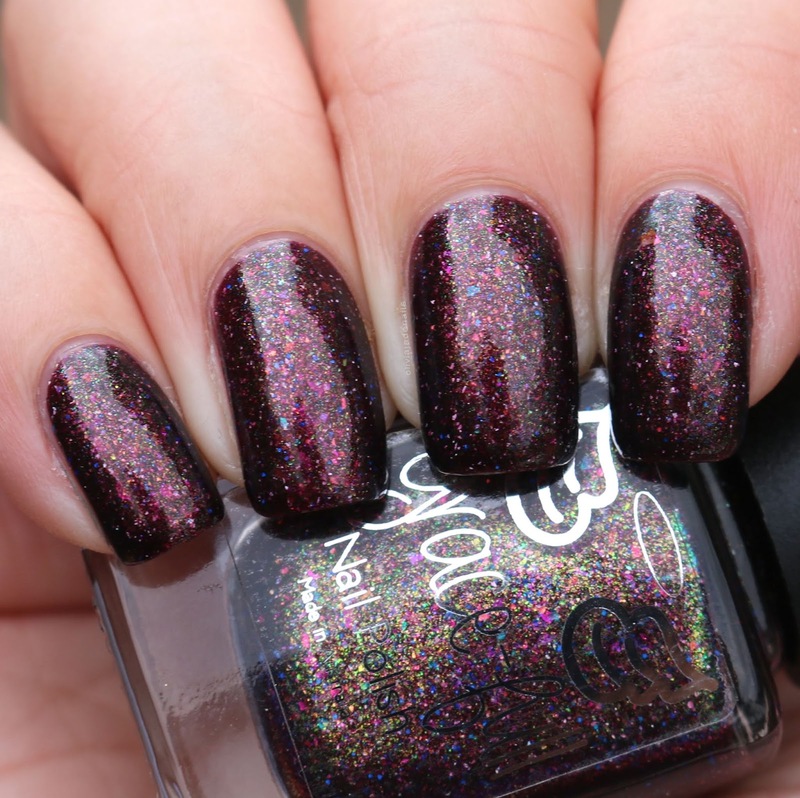 Gooky Spook is a brown jelly with ultra chrome chameleon flakes, holo microglitter and loads of aurora shimmer. I am a big fan of the mix of colours in this polish and the formula is awesome. It applies evenly and is opaque in two coats. Plum Scared is a deep deep purple jelly with ultra chrome chameleon flakes, holo microglitter and is packed full of aurora shimmer for extra pops of colour. Of the two this polish is definitely my favourite! I love the colours and again the formula is awesome. My swatch shows two coats. I'm a big fan of this Halloween Duo. I think both polishes are great. I do really like that they both are dark and moody so are perfect for Halloween, but at the same time they don't scream Halloween which means you can wear them all year round. Do you have certain polishes that you will only wear at certain times of the year? I know I do. The Halloween 2018 Duo will be available from Grace-full Nail Polish on Friday 28th September at 8pm from both the Australian site and the international site. I have mentioned a few times how I am not really a fan of the "inspired by" section of the 31DC2018. Inspired by artwork is definitely one of my least favourite prompts. I thought I would be smart this year and try and plan out some of my manis in advance so that it would be easier for me to manage. Last week, I put in my planner that I would do some graffiti nail art (I have stamping plates with graffiti style images). I pulled out Lina Nail Art Supplies Make Your Mark 01 plate and say the hand prints when it become clear that I need to use them! My daughter has done so many hand print paintings (it's really cute watching her hands grow over the years) so I did rainbow colours just like she uses. For this mani I used Emily de Molly Bright Retreat for my base and stamped using Bundle Monster Quasar, TeePee Tipping, E-tronica, Opus One, Astronomical, Monarch Dream and Kandi Spirit. I'm really happy how this one turned out. I think it's fun. What do you think? 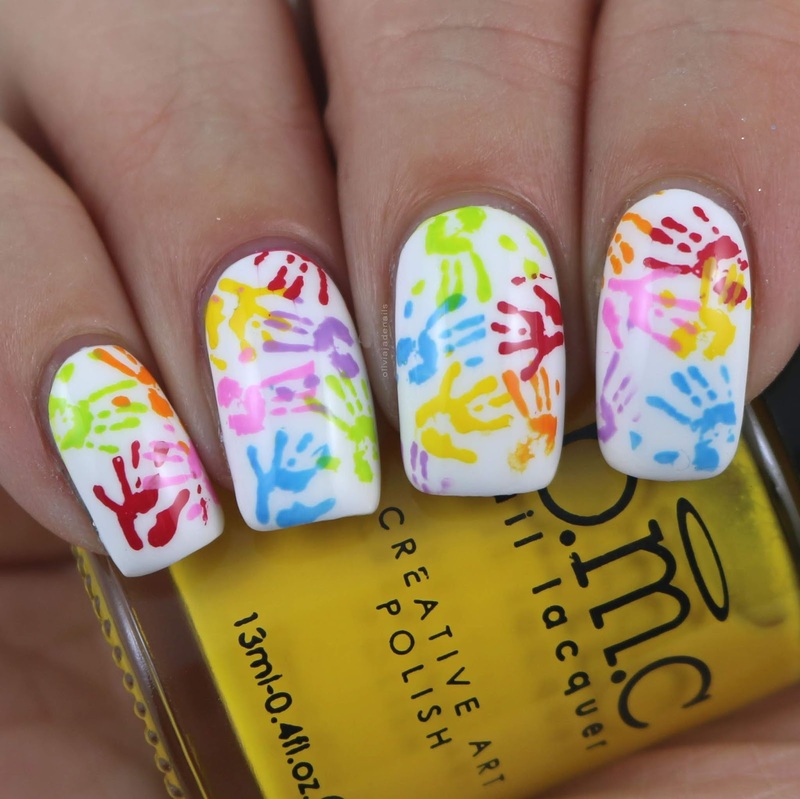 Would you wear a mani like this? Happy Wednesday everyone! I hope your week has gotten off to a good start. This week is definitely going by quite quickly for me, but then again most weeks go by quickly especially this late in the year. Anyway, today I have another 31DC2018 mani for you. The prompt is inspired by a pattern. Like with yesterday, I am combining today's prompt with a plate that I was sent to swatch by Uberchic Beauty - Culture Rich. If this plate doesn't scream patterns then I'm really not sure what does. One of the first things that I thought when I saw this plate was neon gradient! It has been a while since I have done gradient stamping so that is exactly what I have done today. For my base I used Pretty Serious Cosmetics Absence and stamped using Hit The Bottle's neon stamping polishes in High Voltage Violet, I Pink Therefore I Am and Orange You Excited. Here is a closer look at the Culture Rich plate. For this mani I used Orly Scenic Route, Mirrorball (over Color Club Beg, Borrow & Steel) and Emily de Molly Bright Retreat. See what I mean about the patterns? I think there is some really cool designs on this plate. I love that they have the hand drawn look about them and aren't perfectly done (if you know what I mean). 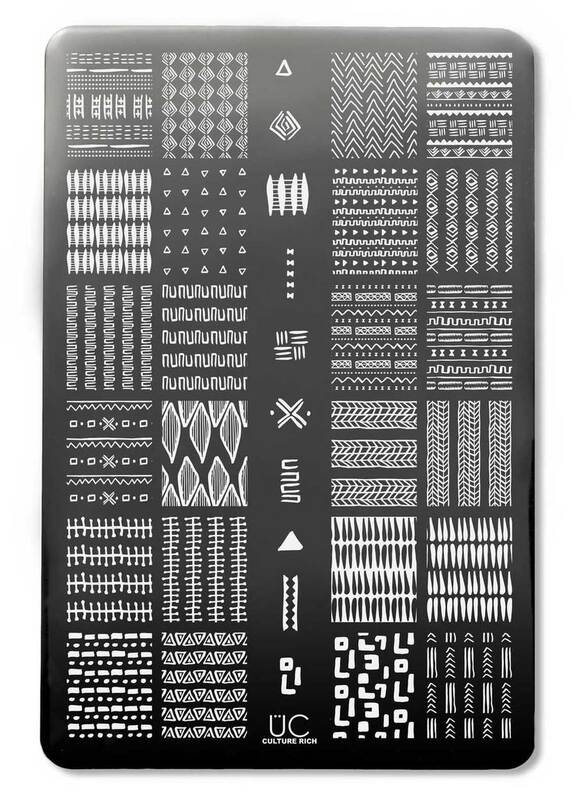 The Culture Rich stamping plate is available now from Uberchic Beauty. 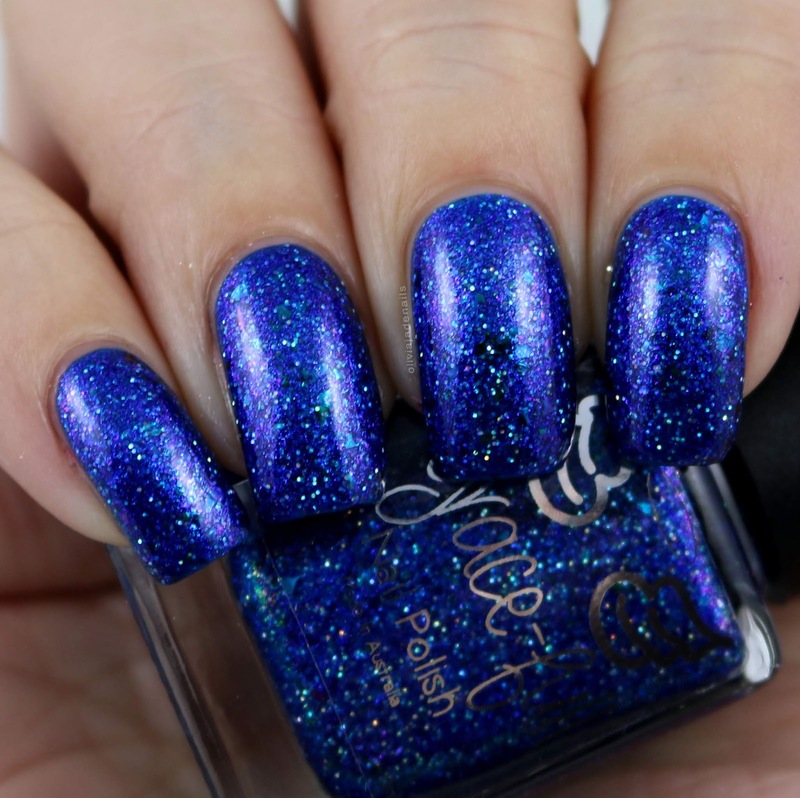 If you saw my blog post from yesterday then you will have already seen one of the polishes from Grace-full Nail Polish's upcoming Enchanted Fables Collection. I am beyond excited to finally be able to share this collection with you guys! It has so many gorgeous polishes. My daughter was super excited when she saw this collection as it is inspired by Fairy Tales (or in my daughter's mind Princesses!). It was super cute watching her open each of the polishes and guess who they were inspired by. She did an amazing job too! I know, I know, enough chatting Tracy, SHOW US THE POLISHES! 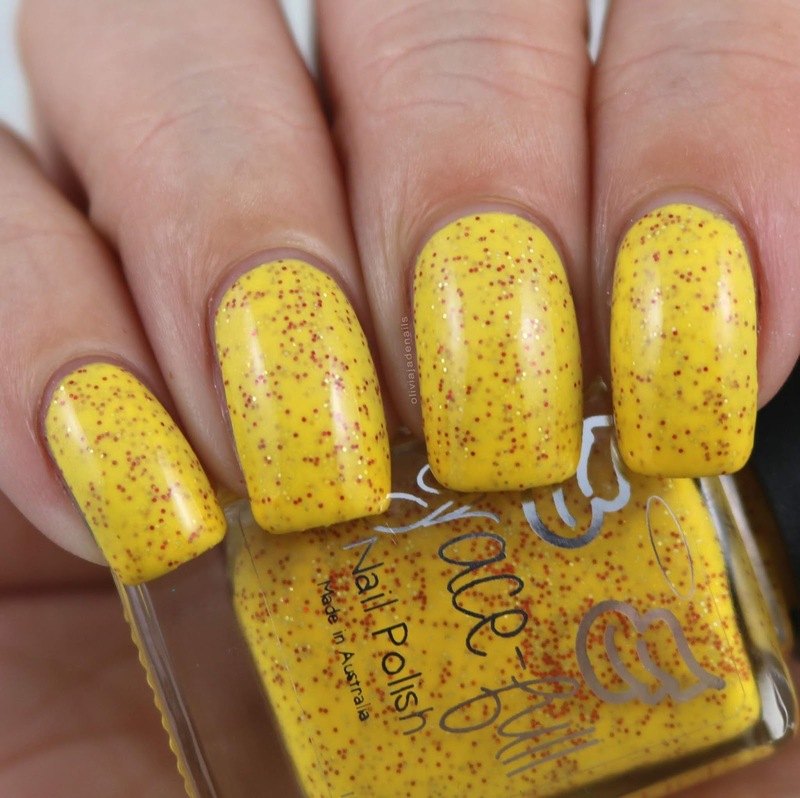 Belle Of The Ball is a yellow (cold) to very light yellow (warm) thermal with gold and red holo microglitter throughout. 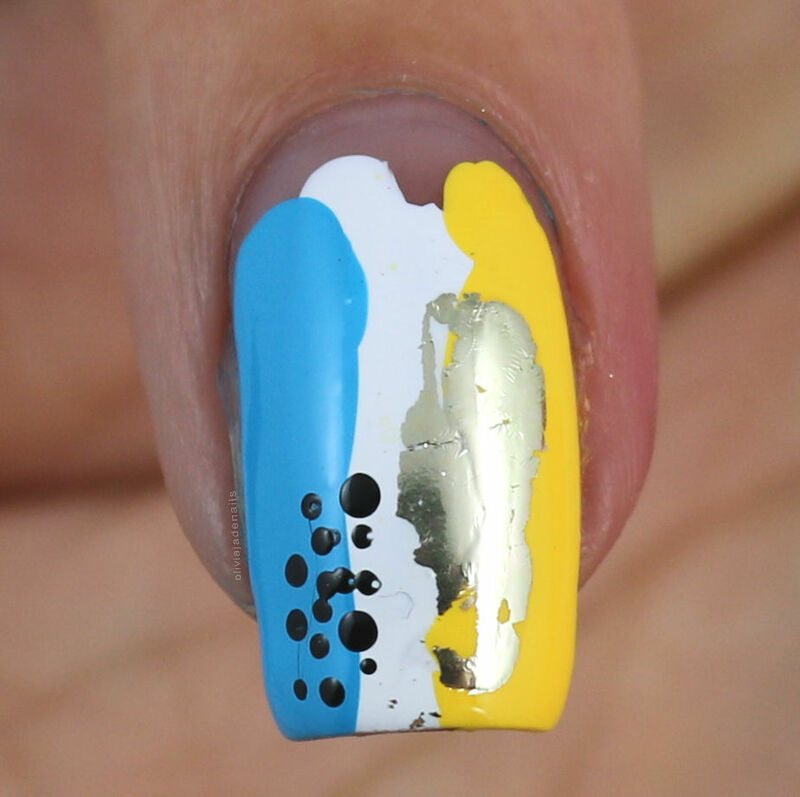 In case you couldn't guess, this polish is inspired by Beauty And The Beast. I think this polish definitely suits it's inspiration (and is definitely needed in this collection) however it's not really my cup of tea. The formula is good and applies evenly. I used three coats for my swatch (mainly because I was worried about it being too sheer in it's warm state). Hair-o-ine is a purple orchid linear holo base packed with lavender and pink shimmer. 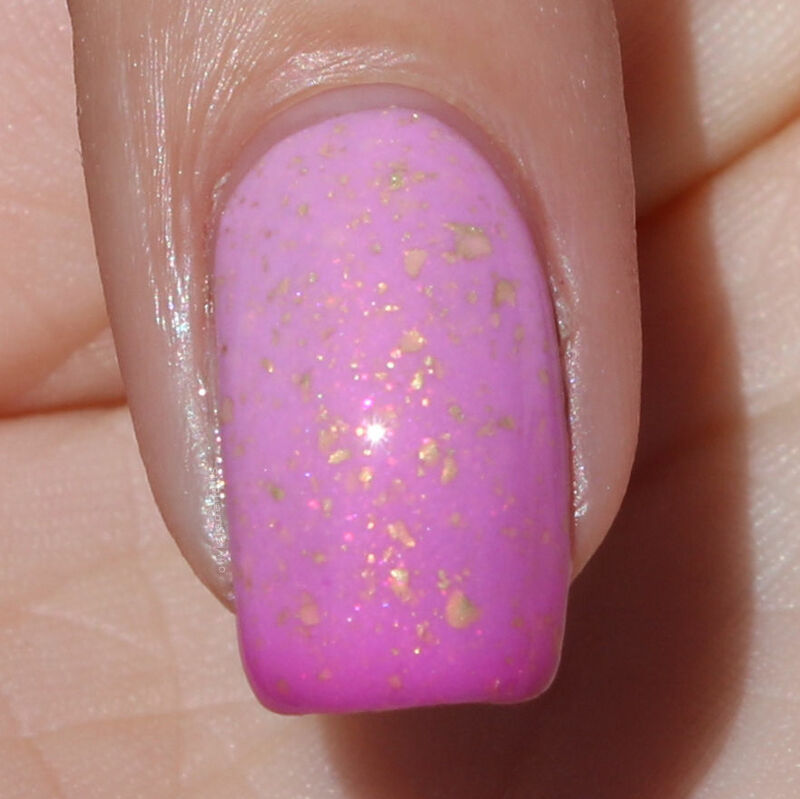 This polish is inspired by Rapunzel (who I think may just be my favourite Princess). I love this polish! I think it is absolutely gorgeous and will definitely be making its way to my favourites list at the end of the month. The formula is awesome and it is opaque in two coats. If The Shoe Fits is a light blue linear holo with shimmer in blue and pink, and chameleon iridescent flakes. This polish is inspired by Cinderella. Such a gorgeous colour and the formula is great, although it is a little on the sheer side (well for me anyway). I used three coats for my swatch. Kiss A Prince is a pea green linear holo with rose gold flakes and crystal chameleon flakes in pink, green and gold. This polish is inspired by The Frog Prince. I think this polish is the perfect representation of Tiana's dress. It's the right green and has a hint of yellow. Plus the flakes give it a fun twist. I think that this is also a great green for Halloween. The formula is great and is opaque in two coats. Mister Right is a royal blue (cold) to sky blue (warm) thermal with silver flakes and aurora shimmer. 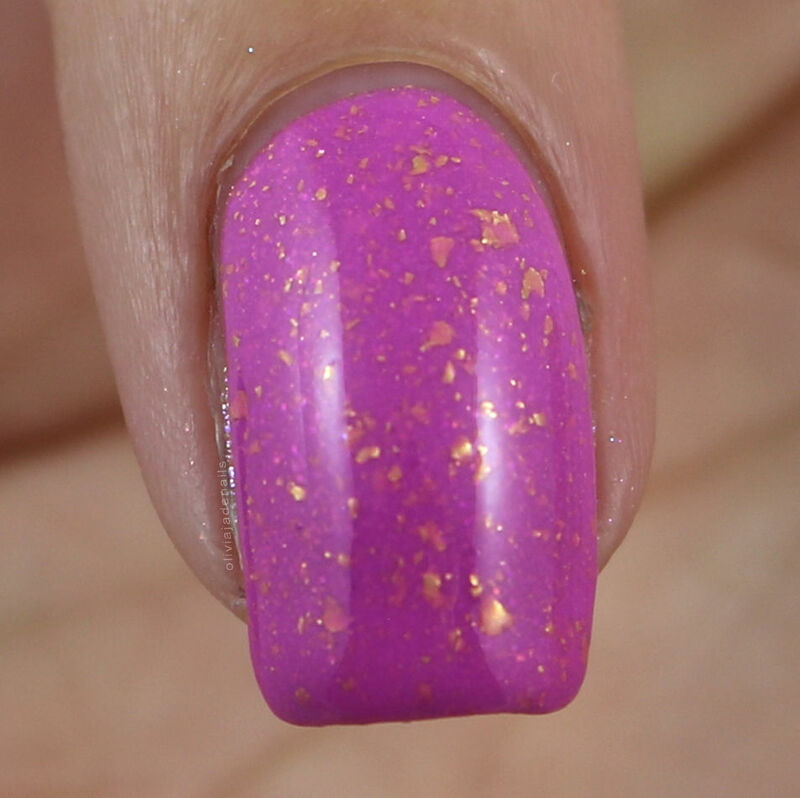 This polish is inspired by Prince Charming. I really like this thermal in both it's states. The formula is also great and is opaque in two coats. 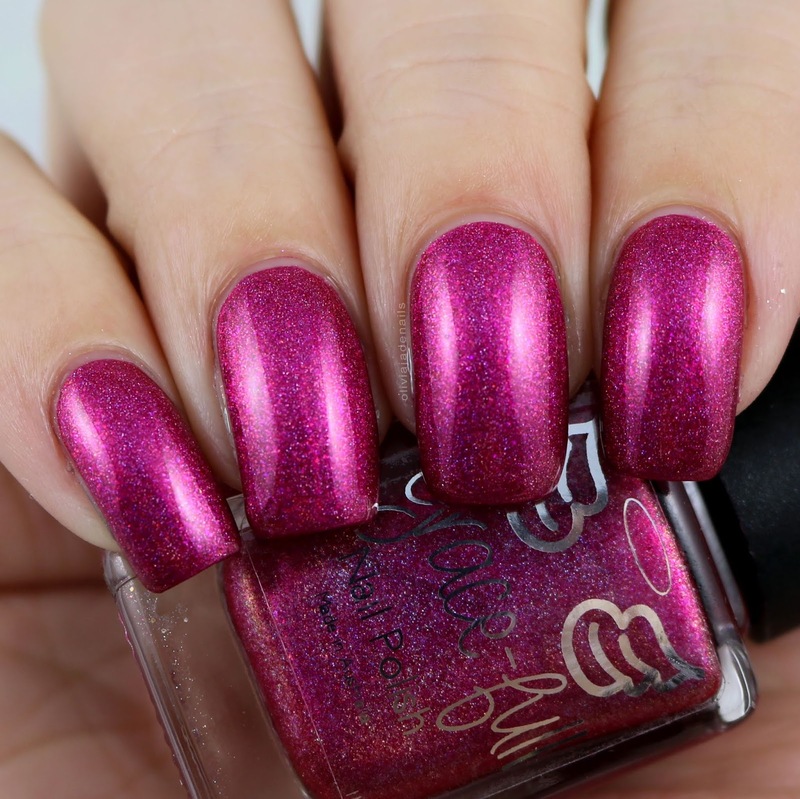 Pick Your Poison is an aurora shimmer that allows this polish to be hot pink in some lights and bright red in others. This polish is inspired by Snow White. I love this polish! It actually reminds me of one of my very first OPI polishes (they are very different polishes but it just brings back the memories of when I first wore the OPI - it was one of the reasons why I started collecting nail polish). Anyway, the colour is gorgeous and it has this nice glow or something about it. It's hard to describe really, but it is magical. My swatch shows three coats, however you can get away with two coats. Siren Tale is a turquoise metallic flakie with sparks of blue metallic flakes. This polish is inspired by The Little Mermaid (as you may have seen in my blog post yesterday). This is the perfect mermaid polish! It's stunning! The formula is easy to use, however I did find it a little sheer (for my personal taste). I used three coats for my swatch. Sleeping Rose is a rose pink (cold) to light pink (warm) thermal with gold flakes throughout. This polish is inspired by Sleeping Beauty/Briar Rose. I especially love the cold state of this polish, but also like the warm state. The formula is awesome and is opaque in two coats. I am a huge fan of this collection! I think each of the polishes represents each of the characters beautifully. My absolute favourites would have to be Hair-o-ine, Pick Your Poison and Siren Tale, closely followed by Sleeping Rose and If The Shoe Fits. 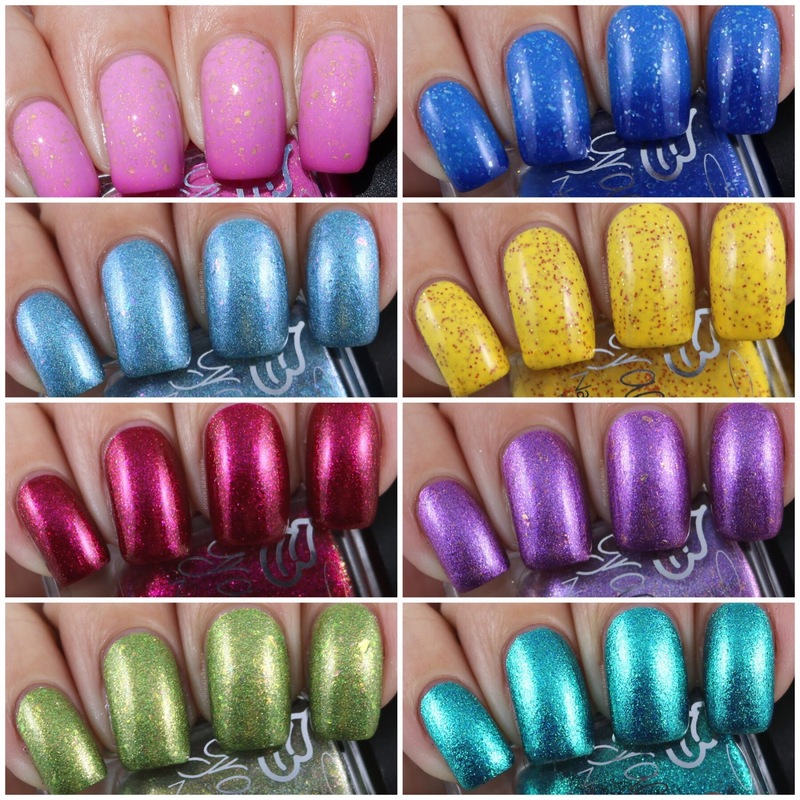 The Enchanted Fables Collection will be available from Grace-full Nail Polish on Friday 28th September at 8pm from both the Australian site and the international site.